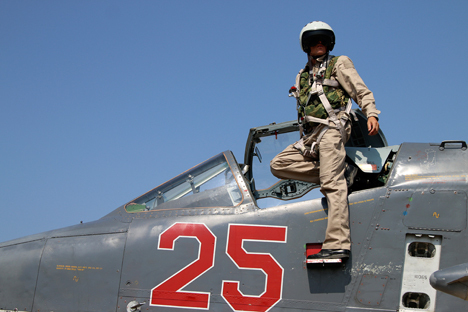 Moscow’s decisive action in neutralising ISIS seems like a good idea compared with US actions. Moscow is using its massive firepower to subdue terror and in the process dramatically alter the balance of power in the Middle East. But there are more gains it may not have foreseen. With its devastating air strikes on ISIS and US-funded rebel groups, Russia is now at the centre of the Syrian chessboard. Besides the obvious gains that include securing Syrian President Bashar al-Assad’s secular government and exposing American backing of terrorist groups, here are six strategic spinoffs from Moscow’s military action. Following their spectacular performance over Syrian skies, Russia’s Sukhoi warplanes are set to be the hottest commodity in the international arms market. With the MiG-29 providing top cover, the Sukhois – including the massive Su-34 fighter-bomber, the swing-wing Su-24 ground attack jet and the subsonic Su-25 tank buster – are doing a fantastic job. While the Su-24 is due for retirement, the Su-25 and Su-34 tandem could be the hottest new items on the wishlist of air forces around the world. The cruise missiles – probably the Klubs – that are thudding into terrorist hideouts are also likely to see an increase in popularity. After a near collision with a Russian jet, the US Air Force ordered its fighter pilots to stay clear of areas where Russians are operating. The near miss gives you an idea of the cramped confines in which foreign aircraft have to fly. This proximity has allowed Russia to gather valuable intelligence on a variety of US and NATO aircraft, including the F-22, claimed to be the world's premier stealth fighter. Such opportunities are rare and the boffins in Russia’s military intelligence must be having a lot of fun going through all that data. ISIS was selling Iraqi and Syrian crude oil on the black market for as low as $10 a barrel. The regular market price is around $47 a barrel. Exporting oil requires transporting it via pipelines to the coast. Clearly, ISIS was free to conduct the sale of illicit crude without the fear of NATO airstrikes. This alone is enough evidence that ISIS was enjoying some form of American and NATO protection. Although ISIS exports were just a trickle in the torrent of crude oil flooding the world, the markets responded positively to the Russian airstrikes by moving up. Even a small uptick in the price of oil translates into billions of dollars in revenue for Russia. Saudi Arabia is losing its shirt because of its relentless production of crude oil aimed at weakening Russia and Iran. The IMF says the Saudi budget is in tatters, and the outlook appears grave for the kingdom. Russia’s comeback in the Middle East along with Iran and the Hezbollah – the Shiite militant group that gives nightmares to the Saudi sheiks – could be the incentive that OPEC's largest member needs to announce production cuts. Having lost face, the US is no longer in a position to ask the Saudis to hold the line. It has taken only a few Russian missiles to bring Europe to its senses. Europeans are taking the view that Moscow’s decisive action in neutralising ISIS seems like a good idea compared with US actions that created millions of refugees who are now flooding into Western Europe. Both Germany and France are thinking of rolling back economic sanctions against Russia. That’s called cost-effective diplomacy. By launching cruise missiles from the Caspian Sea 2400 km away – instead of the Mediterranean where the Russia Navy has stationed a powerful armada – Russia is indicating that it has multiple options. The Caspian was considered a Russian lake for centuries, and Moscow is signalling that nothing has changed today. It is also a message to the US that the Russian military has access to Iranian and Iraqi airspace. Plus, it shows the range and lethality of its cruise missiles.